Air duct cleaning in Albuquerque is vital in helping relieve allergy problems; molds and other agents that affect the quality of air in the home. Almost everyone thinks of our door air quality but forget about the inside air. The quality of indoor air is important too. There are many advantages of having clean ventilating ,heating and air conditioning systems. The clean air ducts aids in having a healthy home and a comfortable living environment. Based on recommendations of environmental agencies scheduling a professional cleaning of air ducts is vital. Removal of dust, pollen, animal dander and airborne contaminants is an important part of air duct cleaning. The contaminants can be pulled into the HVAC system when the air conditioner or furnace is at work. The increasing amounts of the contaminants makes the air ducts a breeding site for molds, spores, bacteria and fungus among others things. These are common problems in Albuquerque are that require immediate action. 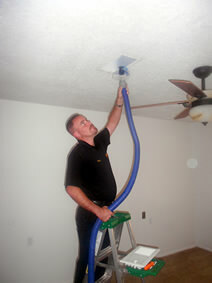 Air Duct Cleaning in Albuquerque is a service that helps people get rid of respiratory problems. Recirculation of microbes in the home makes adults and children alike victims of indoor air pollution. Clean air ducts ensure clean air free of microbes, a healthy family and cost reduction cooling and heating expenses. Another reason to get your air ducts cleaned is rodents and other animals. Critters can call into your air ducts and deposit feces, build nests, and just cause trouble. A good cleaning helps prevent these problems too. Air Duct Cleaning is another service offered by Xtreme Clean. In summer and winter, these ducts can go everyday all day, supplying either heat or air conditioning. Air duct cleaning becomes essential to make sure these ducts are free of obstructions, and sparkling clean as it delivers warm/cool air to your home!